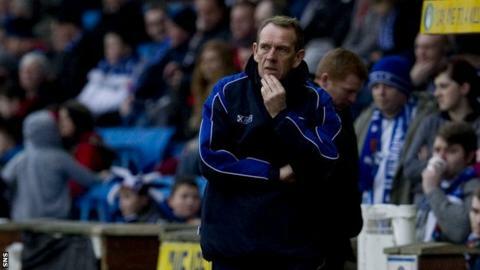 Coleraine manager Oran Kearney is "ready" to replace Alan Stubbs at St Mirren, says Kenny Shiels. Kearney, who is the former Kilmarnock manager's son-in-law, held talks with the Buddies on Wednesday about becoming their new boss. The teacher was interviewed for the Saints job in the summer but lost out to Stubbs, who left the club on Monday. "He's very ready and, if he takes it, Coleraine will be the losers here," Shiels told BBC Scotland. "St Mirren will have a good guy, a really good manager. Someone who is straight and doesn't suffer fools. He's very streetwise, sincere and honest how he works. "He's organised and that's the kind of manager you want." Kearney, 40, won the Irish Cup with Coleraine last season, while they narrowly missed out on the Irish League title having only lost one game. Shiels, who won the Scottish League Cup during his two-year tenure at Rugby Park, admits the timing is not ideal for whoever replaces Stubbs immediately after the transfer window has shut. But he believes Kearney is up to the challenge if he is unveiled in Paisley. "I think the supporters would have to be patient," Shiels added. "You can't really change things because the window has just closed and he's got lots of things going against him. "But he does things patiently and, no matter what people say, he does it his way, which is very single-minded and very assertive how he works." He's still a very young manager. It's going to be a very big decision for Oran. He's a very big family man, he's got to take that into consideration. I think he has a full-time job so there is so much to consider. But I also think it's a great opportunity and if his long-term goal is to be a successful football manager then at one stage he's going to have to move. The Scottish Premiership is a very good place to go to showcase your talents.